The Columbus, GA Ledger-Enquirer reported recently on a lawsuit filed by Major Stefan Frederick Cook, a reserve officer contesting his deployment to Afghanistan. This is another act in the long-running conspiracy-theorist drama about President Obama’s birth and citizenship. This theory holds that there is substantial reason to doubt his citizenship and eligibility to be president. The Certification of Live Birth, at left, was released during the campaign, but apparently it isn’t enough. The oft-repeated demand is for the release of Obama’s “long form” birth certificate, which would contain much more information. Major Cook maintained that his belief that President Obama is not a natural-born U.S. citizen makes him ineligible to be president and commander-in-chief. Following his orders to deploy and engage in combat, he contended, meant that he “would be acting in violation of international law by engaging in military actions outside the United States under this President’s command. …simultaneously subjecting himself to possible prosecution as a war criminal by the faithful execution of these duties.” He went to federal court in Georgia, requesting a temporary restraining order and status as a conscientious objector. The Ledger-Enquirer was overwhelmed by the reader reaction to its first report. The number of daily hits on their website skyrocketed after the story was picked up by the Drudge Report, and huge numbers of reader comments and e-mails inundated the paper and the reporter who wrote the story. Many were extreme and abusive, and some included threats, which meant that law enforcement authorities became involved. A few days later, the paper reported that a retired major general and an active reserve lieutenant colonel had joined the lawsuit. But then something really strange happened — the Army revoked the major’s deployment orders. According to the government’s response to the court, “The Commanding General of SOCCENT (U.S. Special Operations Central Command) has determined that he does not want the services of Major Cook, and has revoked his deployment orders.” Given that fact, the case became moot and was thrown out by the federal judge. Major Cook’s lawyer amended the pleading, saying that the case has broader application and should still be considered. This particular conspiracy theory has been going on for too long. It rages on right-wing websites and blogs, and once in a while it pops out into the mainstream media. 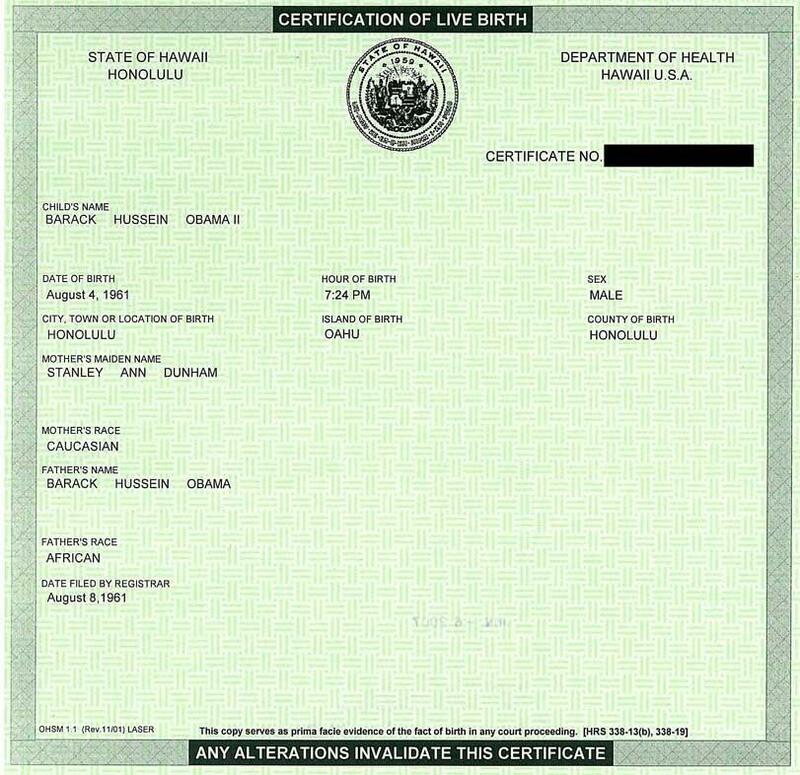 There are several basic claims — Obama was born in Kenya, not Hawaii; he gave up his U.S. citizenship (or his parents did it) when he lived in Indonesia; Hawaii was not a state when he was actually born. There have been a number of related lawsuits, one of which the Supreme Court has refused to hear on appeal. The President could put this whole thing to rest simply by releasing his detailed birth certificate. Why won’t he do that? With the amount of information about him that’s already public, how could this be such a difficult thing to do? Continued refusal to release it just bolsters the arguments of nutcase conspiracy theorists. I am truly interested to see how this case plays out. It is baffling but I can only assume that in the interest of command climate, MAJ Cook is better suited cleaning latrines stateside than he is deployed with his unit. Lisa, I completely agree regarding MAJ Cook. I wouldn’t want him around, either. However, it really is unusual for the Army to revoke the orders of someone who is refusing to follow them. Normally, the process plays out to the end, with the insubordinate soldier in jail, dishonorably discharged, or otherwise punished. Doing otherwise just creates a climate that invites others to try the same thing. On the larger point — the conspiracy theory about Obama’s birth — something needs to be done to kill it. Maybe if Obama released more information, if he can, that would take care of a lot of it. The Army’s action just makes things look worse. I agree completely. I can’t imagine that the Army simply revoked MAJ Cook’s orders; however,I am unaware of follow on actions to ensure good order and discipline. And, how difficult can it possibly be to publicize Barack Obama’s birth documents? The problem is that if people need a conspiracy theory, they will keep coming up with one weird scenario after another. I’m sure even the extended birth certificate won’t be enough. As soon as it gets released, there will be people who’ll start saying that it’s been forged, altered, or smuggled in by extraterrestrials. “…smuggled in by extraterrestrials.” Funny, but some nutcase would undoubtedly make that claim. There are some real weirdos out there. To add fuel to the fire, Obama is spending money on lawyers to keep this issue out of the courts. It is a longstanding legal tradition in this republic to fight cases you do not want to lose. If the point is moot, or opposing councils have stipulated to a point, there is no legal quarrel. And it isn’t just the right. The first suit was brought by Phillip Berg, “… a former gubernatorial and senatorial candidate, former chair of the Democratic Party in Montgomery (PA) County, former member of the Democratic State Committee, and former Deputy Attorney General of Pennsylvania.” Berg, it should be noted, was a Hillary supporter. The issue of whether or not Hawaii had statehood when Obama was born is irrelevant. When the constitution was drafted and ratified, the ONLY people that were United States citizens were those born in DC and on United States land and territories (US possessions), forts, magazines, and arsenals. That was true up until 1868 when the 14th amendment was ratified. At that time (1789), there was no 14th amendment which automatically conferred federal citizenship on those born in any of the several states. So, even if Hawaii had not been a state when Obama was born, if he was born in the Territory of Hawaii, he automatically had US citizenship (provided at least one of his parents met their legal requirements for US citizenship), just as Barry Goldwater did when he was born in the Arizona Territory (AZ didn’t become a state until 1912, and Goldwater was born in 1909). President Obama himself could end this long standing controversy by simply submitting his long form birth certificate that Hawaii has on file and end this entire matter once and for all. American citizens submit their birth certificate to obtain a drivers licenses every week day year around.